Polyethylene and polyvinyl chloride, or PVC, are both plastics that form through a mechanism called radical polymerization. The reaction conditions used for each are different, as are the structures, properties and uses of the finished materials. Both polymers are chemicals you use all the time in your daily life. Water pipes in wells and underground to the house, along with garden hoses and vinyl raincoats, typically consist of polyvinyl chloride, while polyethylene goes into bulletproof vests and a variety of other products because of its strengths and versatility. 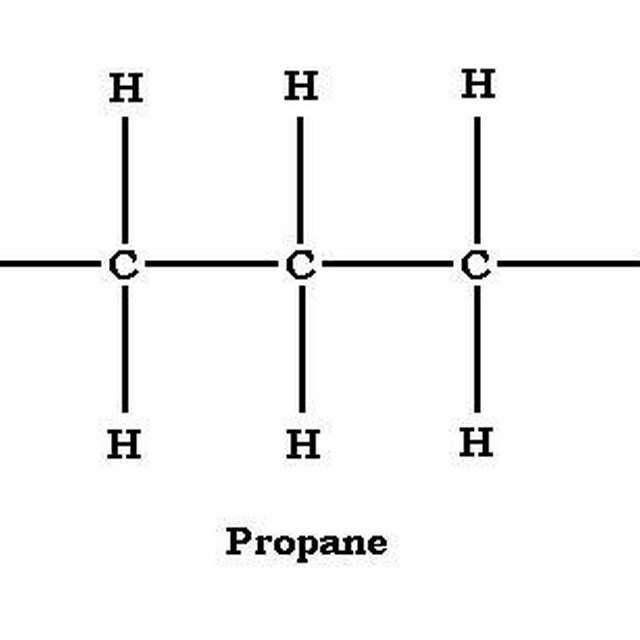 Long chains of carbon atoms make up PVC, where every other carbon atom has a chlorine atom attached to it. Polyethylene, by contrast, is a large chain of carbon atoms with only hydrogen atoms attached; there are no atoms of chlorine, oxygen or any other elements. While PVC always has the same basic structure, polyethylene forms into several different types based on the degree of branching from the main chain in each polymer. Some types of polyethylene, such as low-density polyethylene, are highly branched, while other types have a more unbranched structure. Manufacturers create polyethylene and PVC through radical polymerization, in which a type of peroxide, splits into two radicals. One of these radicals attacks the double-bonded carbon group, which now becomes a radical and can go on to attack other double-bonded carbon groups in turn. PVC, however, consists of subunits of vinyl chloride. Each vinyl chloride monomer has a pair of double-bonded carbons with a chlorine atom attached to one of them. Polyethylene comes from ethylene subunits. Special catalysts used when making polyethylene ensure the chain stays unbranched, while no catalyst is needed with PVC. Both polyethylene and PVC are waterproof, but PVC is more so. Additionally, PVC is much more fire-resistant than polyethylene, because the chlorine atoms it releases during a fire inhibit the process of combustion. PVC in its native form is brittle and hard, so it needs softening and flexibility by adding other compounds called plasticizers. Polyethylene's properties depend on the type. LDPE is much softer and more malleable than linear polyethylenes such as high-density polyethylene, or HDPE. PVC is one of the most popular plastics in the manufacture of plumbing components. It's also used to make garden hoses, raincoats and vinyl leather bags. Polyethylene has an almost innumerable variety of uses. LDPE makes up plastic films and shopping bags, while the sturdier HDPE makes up everything from large containers to plastic milk jugs and children's toys. Ultra-high molecular weight polyethylene, or UHMWPE, is so strong that you can find it in bulletproof vests and ice skating rinks. Brennan, John. "The Difference Between Polyethylene & PVC." Sciencing, https://sciencing.com/difference-between-polyethylene-pvc-8531363.html. 18 May 2018.